We present a combined resummation for the transverse momentum distribution of a colorless final state in perturbative QCD, expressed as a function of transverse momentum p T and the scaling variable x. Its expression satisfies three requirements: it reduces to standard transverse momentum resummation to any desired logarithmic order in the limit p T → 0 for fixed x, up to power suppressed corrections in p T; it reduces to threshold resummation to any desired logarithmic order in the limit x → 1 for fixed p T, up to power suppressed correction in 1 − x; upon integration over transverse momentum it reproduces the resummation of the total cross cross at any given logarithmic order in the threshold x → 1 limit, up to power suppressed correction in 1 − x. Its main ingredient, and our main new result, is a modified form of transverse momentum resummation, which leads to threshold resummation upon integration over p T , and for which we provide a simple closed-form analytic expression in Fourier-Mellin (b, N ) space. We give explicit coefficients up to NNLL order for the specific case of Higgs production in gluon fusion in the effective field theory limit. Our result allows for a systematic improvement of the transverse momentum distribution through threshold resummation which holds for all p T, and elucidates the relation between transverse momentum resummation and threshold resummation at the inclusive level, specifically by providing within perturbative QCD a simple derivation of the main consequence of the so-called collinear anomaly of SCET. 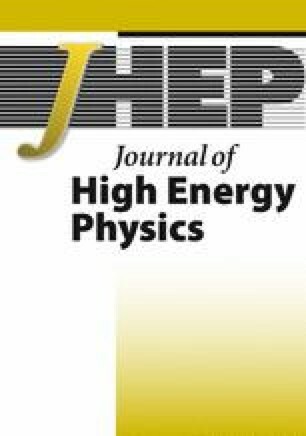 D. de Florian, A. Kulesza and W. Vogelsang, Threshold resummation for high-transverse-momentum Higgs production at the LHC, JHEP 02 (2006) 047 [hep-ph/0511205] [INSPIRE]. E. Laenen, G.F. Sterman and W. Vogelsang, Recoil and threshold corrections in short distance cross-sections, Phys. Rev. D 63 (2001) 114018 [hep-ph/0010080] [INSPIRE]. Y. Li, D. Neill and H.X. Zhu, An Exponential Regulator for Rapidity Divergences, submitted to Phys. Rev. D (2016) [arXiv:1604.00392] [INSPIRE]. R. Bonciani, S. Catani, M.L. Mangano and P. Nason, Sudakov resummation of multiparton QCD cross-sections, Phys. Lett. B 575 (2003) 268 [hep-ph/0307035] [INSPIRE]. S. Catani, M.L. Mangano and P. Nason, Sudakov resummation for prompt photon production in hadron collisions, JHEP 07 (1998) 024 [hep-ph/9806484] [INSPIRE]. P. Bolzoni, S. Forte and G. Ridolfi, Renormalization group approach to Sudakov resummation in prompt photon production, Nucl. Phys. B 731 (2005) 85 [hep-ph/0504115] [INSPIRE]. S.M. Aybat, L.J. Dixon and G.F. Sterman, The Two-loop anomalous dimension matrix for soft gluon exchange, Phys. Rev. Lett. 97 (2006) 072001 [hep-ph/0606254] [INSPIRE]. S. Moch, J.A.M. Vermaseren and A. Vogt, Higher-order corrections in threshold resummation, Nucl. Phys. B 726 (2005) 317 [hep-ph/0506288] [INSPIRE]. S. Catani, D. de Florian and M. Grazzini, Universality of nonleading logarithmic contributions in transverse momentum distributions, Nucl. Phys. B 596 (2001) 299 [hep-ph/0008184] [INSPIRE]. G. Bozzi, S. Catani, D. de Florian and M. Grazzini, Transverse-momentum resummation and the spectrum of the Higgs boson at the LHC, Nucl. Phys. B 737 (2006) 73 [hep-ph/0508068] [INSPIRE]. H. Contopanagos, E. Laenen and G.F. Sterman, Sudakov factorization and resummation, Nucl. Phys. B 484 (1997) 303 [hep-ph/9604313] [INSPIRE]. S. Forte and G. Ridolfi, Renormalization group approach to soft gluon resummation, Nucl. Phys. B 650 (2003) 229 [hep-ph/0209154] [INSPIRE]. M. Bonvini, S. Forte, G. Ridolfi and L. Rottoli, Resummation prescriptions and ambiguities in SCET vs. direct QCD: Higgs production as a case study, JHEP 01 (2015) 046 [arXiv:1409.0864] [INSPIRE]. S. Catani and M. Grazzini, Higgs Boson Production at Hadron Colliders: Hard-Collinear Coefficients at the NNLO, Eur. Phys. J. C 72 (2012) 2013 [Erratum ibid. C 72 (2012) 2132] [arXiv:1106.4652] [INSPIRE]. T. Huber and D. Maître, HypExp: A Mathematica package for expanding hypergeometric functions around integer-valued parameters, Comput. Phys. Commun. 175 (2006) 122 [hep-ph/0507094] [INSPIRE]. S. Albino and R.D. Ball, Soft resummation of quark anomalous dimensions and coefficient functions in MS-bar factorization, Phys. Lett. B 513 (2001) 93 [hep-ph/0011133] [INSPIRE]. S. Catani, D. de Florian and M. Grazzini, Higgs production in hadron collisions: Soft and virtual QCD corrections at NNLO, JHEP 05 (2001) 025 [hep-ph/0102227] [INSPIRE]. A. Kulesza, G.F. Sterman and W. Vogelsang, Joint resummation for Higgs production, Phys. Rev. D 69 (2004) 014012 [hep-ph/0309264] [INSPIRE].